Around the world, inheritance is becoming an increasingly taxing issue. More and more people in Britain are finding that their estates fall above the inheritance tax threshold, or nil-rate band, of £325,000. In this special edition devoted to the subject, several voices from within the industry are calling for reform of IHT in Britain. Writing for International Investment, Utmost’s Simon Martin believes, “Anyone who has studied this piece of legislation will no doubt agree that the rules here are incredibly complicated.” And Neil Jones from Canada Life International, argues that if the British government doesn’t take action on the nil-rate band, then the market will. Elsewhere, Pedro Gonçalves takes a wider look at IHT updates from around the world. And Tim Searle, from Globaleye, looks at how changes to UK property taxes are affecting nationals from the GCC. The latest official figures from HMRC reveal the British government received over £5bn in IHT receipts last year. Total IHT receipts have almost doubled since 2010-11, having risen by 10% year-on-year on average since 2009-10. The ongoing increase has been driven by rising asset values and the freezing of the nil-rate band since April 2009. Laura Suter, personal finance analyst at AJ Bell, commented: “Freezing rate bands is an age-old Government trick to stealthily boost receipts as asset values rise and more people are dragged into paying tax. “When it comes to IHT, this has happened through a freezing of the so-called nil-rate band in 2009/10 at £325,000. It has remained at this level in the eight years since, meaning more and more estates are being hit with IHT bills on death as the value of their estates have risen post-crisis. “An additional residence nil-rate band of £100,000 was introduced in 2017-18, rising to £175,000 by April 2020. This means that a couple will be able to pass on an estate worth £1m without paying any IHT at all. More than half of advisers are not taking any steps to target potential clients aged below 45 as millennials are set to inherit some £1.2 trillion in the next 30 years, according to a report by financial group Sanlam UK. Advisers surveyed say they are concerned about their ability to target this younger generation of clients and are aware of the perceived threat from robo-advisers and financial technology tools, the study found. Almost half of advisers polled (45%) say potential younger clients are more likely to trust science or model-based advice rather than human advisers. Robo-advice was seen as the biggest threat to the future of their firm by 40% of advisers surveyed. More than 11 million people aged 25 to 45 expect to receive some sort of inheritance, with nearly half of those expecting to inherit at least £50,000 in fixed assets or money. How important is IHT planning to your business? Of the 5.1 million expecting to receive £50,000 or more, the mean average value of the inheritance expected was £233,000, which would equate to £1.2trn. Sanlam UK’s chief executive, Jonathan Polin, said the level of inheritance outlined is “unprecedented”. CRS data will enhance HMRC’s ability to detect offshore non-compliance and it is in taxpayers’ interests to correct any non-compliance before that data is received. The Financial Conduct Authority has 33 open investigations into advisers it suspects of giving poor advice and is considering what action it might take in each case. In a letter sent to Work and Pensions Select Committee chairman Frank Field, FCA executive director of supervision Megan Butler explained the regulator’s position on Sipp due diligence failures. The FCA has already prohibited four financial advisers and banned another one from holding a senior position. Questioned by Field about the FCA’s action against Sipp providers, Butler confirmed that two Sipp operators had been referred to the enforcement and market oversight division of the regulator, in relation to due diligence failings on non-standard investments. The Committee’s chairman had also asked Butler whether the UK’s watchdog was considering banning unregulated or non-standard investments from inclusion in Sipps. Butler revealed that a ban is not something that the regulator is considering. “Suitable advice from financial advisers accompanied with effective due diligence checks by Sipp operators is a more proportionate way of preventing harm to consumers rather than imposing a ban,” she said. She added not all unregulated or non-standard investments are high risk like commercial property and fixed term deposit accounts. Quilter’s financial advice arm, Old Mutual Wealth Private Client Advisers, has bought the advice business of a Carlisle-based accountancy firm, its third such transaction in recent months. Old Mutual Wealth Private Client Advisers announced the acquisition of the advisory arm of accountancy business, Saint & Co, adding £100m of assets under advice to Quilter’s national financial planning business, which now advises on over £2bn in client assets. Saint & Co partner and adviser, Philip Dhillon, adviser Trevor Iredale and a support team will all join OMW Private Client Advisers’ Cumbria regional hub. This is Old Mutual Wealth’s third acquisition in the UK financial advice sector this year. It follows the acquisition of Edinburgh-based DG Pryde in May and Wiltshire-based A&M Financial Services in February. In June, Old Mutual Wealth completed its separation from its parent company and its rebranding to Quilter, with the other parts of the business being rebranded one at a time. Utmost Wealth Solutions’ parent company, Life Company Consolidation Group (LCCG), has announced that it is set to acquire Generali’s wealth-management and service units in Ireland and Guernsey for €409m. The deal for Generali Worldwide and Generali Link businesses may add an additional €10m payment on completion, the Trieste-based insurer said in a statement. Paul Thompson, group chief executive of LCCG, said that the deal demonstrates the company’s commitment to the international life market and “further cements” the company’s position in specialist cross border wealth management. Last year, LCCG announced a deal to acquire Ireland-based Generali PanEurope. The deal, which completed in June, saw Utmost enter the European market for the first time, with Utmost CEO Mike Foy predicting further acquisitions. “Through a variety of acquisitions LCCG is creating an extensive portfolio of specialist and successful players in the cross-border and international wealth management marketplaces,” Giorgio Daboni, head of Generali Worldwide, added. Generali Worldwide, a Guernsey-based provider of life insurance-based wealth management, contributed about €35m to the group’s operating result last year. Generali Link, based in Ireland, is a shared-service provider focused on fund and policy information. British pensioners living abroad risk losing over 20% of their pension because of the fluctuations in the pound value as the no-deal Brexit scenario keeps pushing the sterling down. There are an estimated 247,000 British retirees living abroad with pensions paid in sterling. However, pensions held in sterling but drawn in foreign currency via ATMs or bank to bank transfers are always open to currency exchange fluctuation risks. One example shows how the plunging pound cut the expats spending power in just two years. At the beginning of 2007, one pound was worth €1.48, but by January 2009 it had fallen to just €1.06. On a £2,000 a month pension, a retiree living in an EU member state would have initially received €2,960 a month, dropping 28% to €2,120 two years later, according to specialised media outlet Emigrate. Given that the exceptional nature of the fall was linked to the 2008 financial crisis, this may be taken as an illustration of a worst case scenario, but it is also serves as a warning that currency stability in the future is a long way from being guaranteed. Financial advisers suggest that those planning to retire overseas in the near future should begin hedging against the risk of currency fluctuation by designating either all or part of the pension amount in different currencies. One way of mitigating the problem is to decide on where you would like to retire and transfer your entire pension to the relevant currency. The Square Mile could see up to 12,000 jobs lost in the short-term aftermath of Brexit with thousands more at stake longer term, the City of London Corporation has warned. At the lower end of the scale, 3,500 jobs could be lost to EU states, Catherine McGuinness told parliament’s Exiting the European Union Committee. More than two million people work in financial services across Britain, with 396,000 in London. She said: “The number of job losses will depend on the amount of access that the sector continues to have and the amount of business it can follow up there. The City was disappointed that Britain’s government ditched its preferred option of future EU trade based on mutual recognition, whereby Britain and the EU accept each other’s rules under two-way regulatory co-operation. “We had expected continued support for mutual recognition,” Ms McGuinness said. Wealth manager Freddy David has been jailed for six years for defrauding 55 victims out of £14.5m in a Ponzi scheme. Freddy David, of Hartfield Avenue, Elstree, Borehamwood, pleaded guilty at Southwark Crown Court to obtaining a money transfer by deception and fraud by abuse of position. David was also disqualified from being a director of a company for 10 years. The money was used to fund his gambling habit, which saw him spend £15.6m on gambling websites and £240,000 in one day alone, as well as paying for holidays abroad and his children’s school fees, the court heard. David’s friends were among the victims. He convinced them their money was being held in a bank account, accruing up to 8% interest a year. He told them the money was locked in for between three months and five years. He would then move the money from HBFS accounts to his own. He used some of the money to pay other investors’ the “monthly interest” their investment was supposedly accruing. The case was referred to the City of London Police, the national lead force for fraud by the FCA, which became suspicious of the HBFS bank accounts. The investigation by the City of London Police’s Fraud Squad found that the Ponzi scheme ran between 2005 and 2017. Police Staff Investigator, Katie Watkins, said: “David took advantage of individuals who placed significant trust in him. The Bank of England has raised interest rates from 0.5% to 0.75%, the highest level since the financial crisis almost a decade ago, with the financial sector warning that it is taking a gamble as the outcome of Brexit remains unclear. Several experts have challenged the need for a rise now, given not only the Brexit risks but also the backdrop of a sluggish economy and the potential negative impact from US president Donald Trump’s import tariffs on global growth. “Hiking interest rates now – for only the second time since the financial crash – is, to my mind, premature. “At just above the Bank’s target of 2%, inflation is not currently a key issue. In addition, major uncertainty surrounding Brexit, the looming threat of international trade wars, and absolutely average economic growth, business and consumer confidence are on the slide. “As such, there seems little real justification to increase interest rates now,” said Green. “Whilst the decision to hike rates is unnecessary, I think that the Bank is likely to refrain from any more increases until after Brexit,” he added. For Aviva Investors, the BoE has to tread carefully from now on. “We hope the Bank is right. But growth is not that robust and is vulnerable to those known and unknown shocks, confidence is mixed at best and inflationary pressures are pretty muted across the economy. A base rate rise to 0.75% is not going to derail the economy. “The Bank needs to tread cautiously from here and will be monitoring any impact of today’s decision very carefully,” said Stewart Robertson, senior economist at Aviva Investors. The increase is only the second time the BoE has lifted interest rates in 11 years, following its increase from a post-Brexit emergency low of 0.25% in October last year. Raising interest rates will mean higher borrowing costs on mortgages and loans for hard-pressed consumers and businesses as they adapt to Britain leaving the EU. “Looking forward two factors will be critical in determining future interest rates,” said Nick Dixon, investment director at Aegon. “First the final Brexit trade deal will impact the level of sterling and hence inflation. “Second is the labour market and whether wage pressures intensify, especially in the public sector, become embedded and strengthen inflationary trends. Several experts had urged the Bank to keep rates on hold to help support jobs and growth amid mounting fears about the economic impact of Britain crashing out of the EU without a deal. Philip Smeaton, chief investment officer at Sanlam UK said: “With the Fed hiking interest rates, the European Central Bank winding down quantitative easing, and even the Bank of Japan building in the flexibility to reduce monetary stimulus, the Bank of England must have felt left out. “Continuing positive employment figures and wage growth help to justify the increase and the Bank will be hoping that the economy strengthens in the second half of the year. Simon Martin, technical services manager at Utmost, sets out the current status of IHT in Britain. Back in January of this year, the chancellor, Phillip Hammond, sent a letter to the Office of Tax Simplification (OTS). In the letter he acknowledged the OTS’s interest in the Inheritance Tax system in the UK and asked them to conduct a review. Perception of complexity of IHT rules amongst taxpayers, practitioners and industry bodies. Firstly, let’s be clear on one point, IHT is not a big earner for the UK Treasury in comparison with taxes such as Income Tax, National Insurance, VAT and Corporation Taxes – which accounted for more than 82% of total taxes in 2016/17. In comparison Inheritance tax accounted for less than 1% of the capital taxes which in turn made up only around 5% of the total tax take in 2016/17. Looking at these figures alone, and concentrating on loss of tax, some people may argue IHT could be removed entirely, especially if it was deemed the cost of collecting and administering it was deemed considerable by HMRC . However, I believe this very unlikely given the political message it would potentially relay. Furthermore, replacement systems to tax inheritance and wealth, such as those adopted in some European countries, would probably require equally complex legislation. Given the focus is on simplification ‘starting again’ doesn’t seem like a viable solution. There is no clear indication of what may happen following the review, but it’s more likely that we see adjustments to the current IHT system. There are many areas I think could be looked at. Anyone who has studied this piece of legislation will no doubt agree that the rules here are incredibly complicated, especially in relation to the so called ‘downsizing provisions’. Rules need to be understood by the public when reviewing their estate planning and by the legal and tax profession assisting them. Tax rules that are overly complicated create unfairness in the tax system when people inadvertently fall foul of the small print. I can certainly see lots of issues in this area and it seems very odd, to me at least, that a rule exists which provides potentially more IHT relief on death depending on whether someone has ever been a home owner. Increasing the nil-rate band would have been much simpler course to meet their manifesto pledge of a £1m nil-rate band, but of course this could also benefit those wanting to gift during their lifetime! Still, this could have been perhaps countered by, for example, a (small) increase in the number of years required for the gift to become exempt rather than a raft of new and incredibly complex legislation. The value of the small gifts exemptions should certainly be looked at and this would be a good opportunity to review these thresholds based on current value of money. After the gift is made the gift should not reduce the transferor’s standard of living. Evidencing these conditions, especially the final condition, can be difficult and it requires good record keeping on behalf of the taxpayer. I can certainly see some changes in this area as I strongly suspect the time taken for HMRC to check this exemption is also considerable. Business Property Relief (BPR) is there to protect small businesses from the impact of IHT where a significant shareholder dies – although it possible for a shareholder to benefit from BPR even where their death would have no impact upon the future of the company. I wonder if we may see a tightening of the qualifying requirements for BPR? This is an area that certainly needs some attention. The rules here are incredibly complicated following amendments to cover anti-avoidance. HMRC have already published two consultations in which they try and come up with alternative calculations. A previous idea was that a person can only have one settlement nil-rate band during their lifetime and perhaps we will see this developed? I suppose one of the main issues with any changes here is how the change works with the existing rules. Clearly, any new rule that doesn’t operate retrospectively will not create simplification, as you will end up with two sets of rules in force. Conversely, any new rule that comes into play retrospectively has to be fair and work within the parameters of the planning that has been put in place. Let’s not forget here that trusts are commonplace in areas such as will drafting – so any change that is retrospective will be problematic (and costly) if it would mean many people would need to review their wills. Lessons should be taken from the changes to trusts announced in the 2006 Finance Act whereby the industry had to lobby for significant changes – such as the introduction of the Immediate Post Death Interest Trusts. As somebody who has studied UK tax legislation over the last 20 years I’m going to be bold here and make a request. What the UK tax system needs, in my view, is a period of increased stability. Whilst I understand that changes to the rules are sometimes necessary, continually changing tax legislation leads to confusion and misunderstandings by practitioners and clients alike as they adapt to the new rules. I think the OTS should reflect on the changes made in the pension system at A-day as a good example. We were promised simplification but what got instead was an equally complicated system we all had to learn again. During this period of ‘bedding in’ the advice process becomes difficult and clients are at greater risk of receiving incorrect advice. Simplification needs to be balanced with anti-avoidance, and if the current rules need to be complicated then, in all likelihood, I would suggest any replacement rules will end up needing to be equally complicated. I would hope that lessons from the past are learnt here and any simplification is simply tweaking the current rules to make them clearer and fairer rather than any radical changes. In the UK, when you die, the government assesses how much your estate is worth. It then deducts your debts from this to give the value of your estate. Assets include any cash in the bank, investments, properties or businesses owned, vehicles and payouts from life insurance policies. Your estate will owe tax at 40% on anything above the £325,000 inheritance tax threshold. Inheritance tax is one of the most controversial fiscal policies. Some countries simply do not apply it (see boxes). The idea is that without it you perpetuate inherited wealth, so the rich stay rich generation after generation. Inheritance tax aims to redistribute income so some of the money goes to the state to be distributed for the benefit of all. Critics argue that when money’s earned, tax is paid at the time, so with inheritance tax you’re actually paying tax a second time. The Office for Budget Responsibility forecasts the government will raise £4.8bn from the death tax this year. With house prices – usually someone’s most valuable asset – increasing over the years, many more people that would not be considered rich have been caught by the inheritance tax threshold. To tackle this, the government revealed in 2015 that this duty would be scrapped when parents or grandparents pass on a home worth up to £1m (£500,000 for singles). This is being introduced gradually until April 2020. However, it is not as straightforward as it seems. The current allowance whereby no inheritance tax is charged is on the first £325,000 (per person) of someone's estate. Couples can leave a home worth £650,000 without it attracting inheritance tax (singles £325,000). Above the threshold, the charge is 40%. This remains unchanged. What has changed is the introduction of a main residence band. Introduced in the 2017/18 tax year this main residence allowance is only valid on a main residence and where the recipient of a home is a direct descendant (as children, step-children and grandchildren). This is gradually being phased in and is what you'll get on top of your existing allowance. For this tax year it's starting at £125,000 (meaning a total allowance of £450,000), rising by £25,000 each year till it reaches £175,000 (meaning a total allowance of £500,000) in 2020. So now the maximum that can be passed on tax-free is £900,000 for married couples or those in a civil partnership, £450,000 for others. For singles, this is made up of the existing £325,000, plus the extra £125,000. For couples, when the first one dies their allowance is passed to the survivor, so that £450,000 is doubled to £900,000. In 2020, the tax-free amount will rise to £1m for couples (made up of £325,000 x 2 plus £175,000 x 2) and £500,000 for singles (made up of £325,000 plus £175,000), as the main residence allowance rises. On properties worth between £1m and £2m, inheritance tax will be paid as normal on the amount above the tax-free amount. So currently everyone is entitled to leave an estate valued at up to £325,000 plus the main residence band of £125,000 giving a total allowance of £450,000. For estates under this the beneficiaries will not pay any inheritance tax. If you leave behind assets worth £500,000, your estate pays nothing on the first £450,000 and 40% on the remaining £50,000. A total of £20,000 in tax if you’re not leaving anything to charity. How do you advise on IHT tax matters? For the above example, all sums double in the case of a married couple or in a civil partnership. If death and taxes are certain for everyone, how much you actually pay is completely up to you. Gifting assets. Transfers of assets to younger relatives made seven years or more before death are not usually taxed. So anyone who has a buy-to-let property, for example, can put it in the name of one of their children, if they do not need the income from it to support their retirement, in enough time for the seven year exemption to apply. Gifting money. Beyond property, you can give cash or shares to your family at least seven years before you die. Buying AIM shares. The UK government has attempted to use the tax system to subsidise investment in businesses that would otherwise struggle to raise funding. To this end, it has made shares in companies listed on the Alternative Investment Market (AIM), exempt from inheritance tax when bequeathed. Trusts. Putting money or assets into a trust can protect it from liability for IHT. The government says that if you die within seven years of a transfer into a trust, the estate will pay the death duty at the full rate of 40%. If a payment is made into a trust during one’s lifetime, and you do not die within seven years, a charge of 20% is payable. All the above solutions were simplified and are not a comprehensive list. It is always worth talking to a specialist about your specific case. WHAT IF I AM AN EXPAT? Just because you live abroad does not mean you are exempt from IHT. Unlike any other tax, UK IHTfollows you around the world, regardless of where you may reside. That’s because it is based on your domicile, not residence. That is why understanding domicile is an important element of estate planning. Living outside the UK does not automatically protect you. The basic rule is that a person is domiciled in the country in which they have their home permanently or indefinitely. Therefore, you can live abroad for many years and still remain domiciled in the UK. Other countries have similar versions of inheritance tax, so depending on where you moved, inheritance tax may be payable twice. Although in most cases the UK would give credit for the tax paid overseas. This is the case for expats in Spain or Portugal. If the HMRC deems you as UK-domiciled, all your foreign assets are liable for IHT. To acquire a domicile of choice, you must be physically present and a tax resident in your new country, have formed the intention of living there permanently and not foresee a return to the UK. You will also need to sever as many ties as possible with the UK. Even stating that you do wish to be buried in your homeland will count against our case. It takes at least three years to shed UK domicile for inheritance tax purposes. You will be deemed domiciled in the UK for inheritance tax if you were UK domiciled at any time in the previous three years, or were UK resident for any part of 17 of the last 20 tax years. A financial adviser will help you establish your domicile status and show you what steps you can take to avoid these taxes for your heirs. While the Government ponders inheritance tax (IHT) simplification, consider this: it’s been almost ten years since the nil-rate band was changed, staying at £325,000 since 2009. Some would argue that if it’s not broken, don’t try and fix it; which ignores the fact that we are in a very different world than that of 10 years ago. To state the obvious, the size of many people’s estates has grown dramatically, and – victim of their own success – the amount of IHT being paid has substantially increased. House price growth has perhaps been overemphasised as the source of this wealth. Even if growth slowed to zero on all forms of capital, families whose income exceeds their outgoings would still be accumulating wealth. Capital growth hasn’t slowed to zero of course, and the fact that we’ve had a bull market for around a decade will only have increased wealth. As a consequence, the Government’s revenues from IHT are predicted to grow in an almost linear fashion. Where is this growth likely to come from? Well, hands up those with estates worth over £1m. According to HMRC, they already pay around three times as much IHT in total as all the estates worth under a million pounds, up from twice as much in 2009. But isn’t more IHT a good thing? Greater revenue for the Government to go on schools, hospitals etc. Fair point, but think about this: is it right that, after working all their lives and paying taxes, taxpayers’ estates probably need to be broken up on death to pay another tax? Or to make a perhaps more practical argument, every year the nil-rate band allowance does not increase it becomes more and more irrelevant. What’s the answer? Indexing the nil-rate band to inflation, as is planned to happen from April 2021, would at least be a start; better would be to link it to average estate size. Root and branch change to the entire IHT system is also feasible, even potentially desirable. IHT has a number of exemptions, perhaps the most useful being the normal expenditure exemption. This allows regular gifts to be made out of income and, provided that the gifts do not reduce the donor’s usual standard of living, there is no limit to the amount that will be immediately exempt. There is no need to wait for seven years and the amount that can be given away each year can increase as excess income increases. But what if gifts have to be made from capital, not income? The nil-rate band is available during lifetime, not just on death. With forward planning, it can effectively be recycled by gifting capital every seven years. Using this strategy can remove a great deal of wealth from the estate very tax efficiently. But, in an uncertain world, can taxpayers afford to give assets away? The reality is that the market is finding workarounds to the limitations of the nil-rate band. Trusts are a particularly common solution. Used the right way, these can often serve two masters – potentially allowing access to capital while creating a timetable to have funds outside the estate within a set period. With an increasing lifespan, many clients are right to be wary of entirely signing away their estate beforehand, no matter the IHT efficiencies. Discounted gift trusts, flexible reversionary trusts and gift and loan trusts all offer some trade-off between IHT efficiency and access. Depending on the clients’ needs, these can help ensure an IHT strategy that suits those needs. With the nil-rate band fixed until April 2021 at the earliest and IHT receipts at a record high, more and more clients are looking for other solutions. The good news is that there are other options. Using certain kinds of bonds, clients can have the flexibility to access their capital without incurring any charges, while retaining the discounted gift trust option as well as access to funds. Canada Life’s flexible Select Account gives clients the flexibility to access their capital without incurring any charges, all within a competitive and transparent charging structure. Planning for any IHT liabilities is one of the most complicated challenges for financial advisers in the cross-border advice marketplace. Many of the world's key international advisers help clients from a host of different countries protect against potential future financial pitfalls that can often sit cross a number of borders. One common message emerges – that failing to plan, is planning to fail. International Investment caught up with seven well-known and firmly established international financial advisers to find out their IHT advice essentials. How challenging is IHT advice for an international adviser? Looking solely at those that are UK-domiciled, the challenge is more to do with lack of knowledge – very few international advisers are Estate Planning / IHT savvy – the new rules on UK residency and UK domicile plus the new rules on enveloped dwellings in the UK have made this a very complex market – it was already niche and thus very few advisers focus on it. What type of products do you utilise to help clients with IHT liabilities? What are the common cross-border difficulties for clients looking to reduce IHT liability? If you are UK domicile cross border is irrelevant because your estate is charged IHT on world-wide assets (non domicile is a different ball game). The advantage of non-residents is they have access to products such as QNUPS. What regions cause more IHT issues traditionally for clients? The interesting and current issue with non doms is things have changed with effect April 2017 and April 2018. The most important change is that long term non doms living in UK will be deemed domiciled UK after 15 years (previously 17 years) for income tax purposes, capital gains and Inheritance tax purposes. Furthermore, any trusts that were created whilst a person was a non dom and non-resident UK will now be treated as if they were created by a UK dom when they return to UK. Trusts for non doms will continue to play a big part in financial planning for instance non-UK sited assets held by trusts set up before an individual is deemed-dom for inheritance tax will remain outside the scope of inheritance tax, subject to the new rules regarding UK residential property held through overseas companies. Non-doms who are not already deemed-dom under the new rules should consider the creation or further use of foreign trusts to hold investments. All forms of cross-border financial advice are challenging due to the complexities of dealing with each jurisdictions’ different tax regimes and regulatory landscapes, combined with the personal situation of each individual client. However, rules on IHT may be one of the most complex areas of all and they change frequently, making it essential for international advisers to ensure that they are always fully up-to-date with the technicalities. There is also the fact that clients, understandably, often find it extremely uncomfortable to discuss what happens in the event of their own death. This can often mean that tackling the IHT issue is left until someone has already died, which drastically reduces the options available to the loved ones. The type of financial products will, of course, depend on the circumstances of the individual client. Typically, assets or money are placed into a trust in order to protect them from IHT liabilities. It is not a challenge per se but a mind set and whether you want to explore this space since it can be a tad more complicated. this space has been typically filled by trustees and various fiduciary types but with the direction of travel on disclosure, the old tricks of trying to mitigate it are fewer. The first is to not have one so we commend clients should enjoy themselves and blow it! But seriously, there are various forms of trust which can be used but these are becoming more complex and less flexible, this is particularly the case for offshore company structures. The best way to tackle IHT, certainly in the eyes of any tax authority, is to just pay it or use an insurance policy that pays it for you. We use innovative insurance structures alongside your property portfolio to devise cost effective solutions for this and we work with trustees to collaboratively help their clients. IHT or as I prefer to call it, death tax, varies between jurisdictions and hence there is a more planning required the more complex the estate of the client concerned. No one territory stands out; the real issue is clients understanding/accepting they have an issue in the first place. IHT is paid by those who do not trust their heirs and/or have not taken advice while they still could. When it comes to working with British expatriate clients, the largest challenge is domicile status. Since it drives the extent of UK inheritance tax liabilities for any given client, determining this and developing advice around this is hugely important. From a client’s perspective, the earlier the client has received an informed judgement on their domicile position, the better, since the later that IHT planning is left, the harder it is to get the fully-desired outcome. This can often be compounded by other issues, such as clients with multiple families in different jurisdictions that will be included in that client’s will, a further challenge that advisers might need to bear in mind when working in expat clients. It won’t be a surprise that one of the largest products and services that we offer in this space is a very solid understanding of tax domiciles and planning around liabilities. Solid liability planning can form the foundation of the advice we give our clients. IHT advice needs to be delivered on a case by case basis – there is no silver bullet that will solve all circumstances. At the end of the day, you broadly need to consider three main questions: how much clients will spend between now and the end of their life, if they want to insure their wealth, or if they are going to retain a lot of their wealth, then what a trust solution would look like. Typically, most clients seek an approach that will incorporate all three approaches. Trust planning has always been a very important solution to offer. Trusts for UK and non-UK domiciles are different, and the types of trust solutions we use at The Fry Group are driven by whether a client needs access to capital or income from the trust; their age and health; their overall level of wealth; and their gifting history. Cross-border difficulties all really stem back to domicile – IHT liabilities are driven by your domicile, not your residency position, and it’s the one area that we often work on the most. However, other common cross border issues include finding legal services in local markets that can draft your will properly and understand the nuances of British IHT liabilities. Additionally, currency can be a challenge since the executor of the estate may need to convert non GBP assets to sterling in order to pay HMRC. Generally, regions that are considered low tax. Take some of the markets in Asia as an example, where tax is often lower. If you’re working in Asia, your estate grows quickly, and this can create IHT issues for clients because of this, that might not exist otherwise. Additionally, you often find that that clients have a second or third families in different tax jurisdictions if they are expats. This can create IHT issues and detailed trust and estate planning is essential. Finally, anywhere with rules on forced heirship can be a burden to overcome, which you typically find in markets in Islamic countries and countries governed by common law. Understanding both local laws as well as domicile is important with regards to IHT planning. IHT and estate planning advice can be very challenging for an international adviser for a number of reasons. For instance, some expatriate clients do not intend to retire in the country they are currently residing in; therefore, they can often have difficulty quantifying how much they will need to retire on and, consequently, how much they can afford to gift or settle into trust to mitigate IHT. In addition, it is more common to meet couples with differing domiciles when working internationally, meaning additional planning considerations and finding an adviser with cross-border expertise and qualifications become increasingly important. Typically, there are a variety of solutions which can mitigate IHT depending on how much control a client is willing to retain over their capital. These include gifting or loaning money to a range of trust arrangements, using excluded property trusts for non-doms who intend to settle in the UK and drawing up a considered gifting strategy either out of normal expenditure or from capital. Insuring against an IHT liability is also something we can advise on; however, compared to markets such as the UK, there is a comparatively small selection of insurers with suitable structures for clients. Clients can run into difficulties if holding assets or business interests in different jurisdictions which have forced heirship rules and no formal double taxation agreement with their country of domicile. For this reason, it is prudent to make wills in each country where a client will hold property or assets. Individuals who are UK-domiciled or non-UK domiciled individuals who are intending to settle in the UK have seen a number of changes in recent years which have had a significant impact on the potential IHT they could incur. These changes include an amendment to the number of years in which an individual will be deemed to be UK domiciled for IHT purposes and an amendment to IHT legislation extending IHT to offshore structures such as offshore companies or trusts which hold an interest in UK residential property. On top of this, the freezing of the nil rate band at £325,000 since 2010 has meant that more and more UK domiciled individuals are being caught in the IHT net due to rising prices across virtually all asset classes. Understanding domicile and residency, and how these factors impact on UK inheritance tax, is far from straight forward. Complex estate planning advice should really be given by tax and trust professionals, and not financial advisers. We give financial planning advice, which encompasses IHT should the client which to address this, as some clients may just want their remaining estate on 2nd death to be subject to estate duties/tax. Do nothing and don’t mitigate. Depending on the size of the estate, cash-flow planning can play an important role because it is essential that the donor establishes exactly how much capital (and income) really is surplus. They must also ensure that they do not continue to receive any value or utility as donors, because this will end up being discounted as a gift by HMRC for inheritance tax purposes (the gift with reservation trap). The main difficulty is that most clients do not understand how local tax law affects their own personal tax position both locally, and internationally. Whether or not a jurisdiction has a tax agreement with the UK – and time spent in that particular jurisdiction – will largely drive how they are taxed during their lifetime, and on death. From a personal tax perspective, probably the US. As has been well documented, anybody with a US connection will probably be caught in some way by the FATCA net. As a result of FATCA, the number of financial institutions willing to advise US nationals and/or US residents has diminished significantly. The lack of expertise has made it very challenging. Property in the UK, particularly London, has always been popular with GCC investors for many years. It has remained a safe haven and an attractive destination for investors and their families from the GCC region perhaps more than any other major city. Depending on the level of investment, well advised foreign investors would use structures to reduce their exposure to taxes. Typically, it would be purchased using various structures such as Trusts, Special Purpose Vehicles (SPV), Private Investment Companies (PIC), or similar offshore corporate structures. For many years, this was the standard method to buy UK property but recent tax changes means this is no longer the case. After the global financial crisis and some would say the advent of Brexit, the UK government sought to increase the taxes on UK property held through structures by introducing a raft of anti-avoidance measures aimed at UK property that is held indirectly. So all the recent structures typically used by GCC investors are now no longer suitable which means on death, the investor is liable for 40% charge. This fee is based on the value at time of death and must be paid before the asset can be passed on to their family/estate. The British prime minister, Theresa May, must raise in excess of £50bn as part of the exit negotiations with the EU. Her fragile position with UK voters means that she needs to look to other areas, non-voters for example, in order to raise the monies needed. That said, this legislation has been raised in the past so some experts would say it was merely a matter of time before this was enforced. HOW MANY INVESTORS WILL THIS AFFECT? A recent report showed that close to half (44%) of all UK properties owned by overseas structures are located in London. Of these properties, more than one in ten (11,500) properties owned by overseas companies are located in the City of Westminster and more than 6,000 properties owned by offshore structures are in the London borough of Kensington and Chelsea. 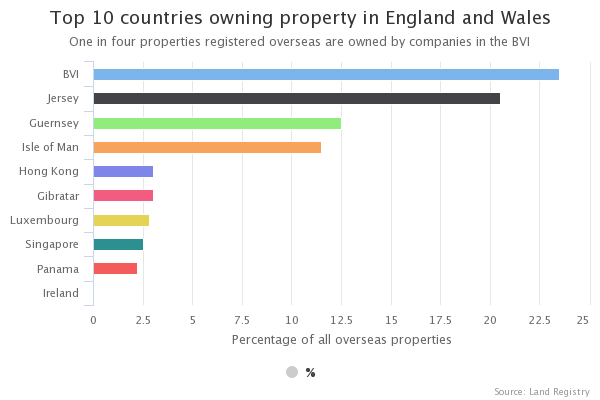 The most common jurisdictions for foreign company ownership of UK property is illustrated in the graph above. 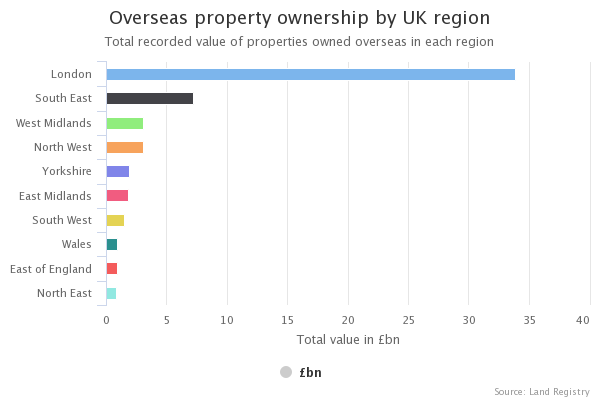 In essence, 1 in 4 UK properties owned by an offshore structure are registered in the British Virgin Islands (BVI). This jurisdiction has traditionally been the most popular due to ease of establishment and moderate costs. Most legal advisors and fiduciary agents prefer the BVI for this reason. The value and location of said properties owned by such structures is illustrated in the graph above right. London remains the clear favourite for the UK property sector as one would expect and has been for many years. It continues to grab headlines with many high-profile purchases from GCC investors and is destined to continue. The concentration of property in London (Zone 1) owned by offshore structures is evident from the aerial view shown above. The new anti-avoidance rules have severely limited tax planning options for non-UK domiciled individuals, whether UK resident or non-resident, in respect of UK residential property. GCC investors need to be aware of this new legislation and the impact on their residential property portfolio. From 6 April 2017, changes to tax rules would mean that non-UK domiciles owning UK property indirectly through corporate structures (purchased either before or after this date) would be liable for UK Death Tax at 40%; this is 40% of the value of the property(s) on death. Working with your lawyers, family office, and/or financial advisers, collectively they can create a solution whereby the property is placed into an insurance contract with a sum assured, which would cover the potential UK Death Tax liability in the event of death. The solution is relatively straight forward and the insurance is low cost and more than mitigates the cost of the potential tax bill. The recent tax changes have far reaching considerations for GCC nationals owning UK property. The current structuring of your UK property assets will need review since it is likely that it no longer provides the protection from the recent death tax legislation changes. It is recommended, if you have not done so already, you contact your lawyers, family office and/or financial advisors to ensure the best solution is achieved to protect the UK property assets effectively and efficiently from this 40% death tax.